Spirit Airlines operates 2 versions of Airbus A321. First version of Airbus A321 is the most common among two versions operated by Spirit Airlines. This version of Airbus A321 offers 218 economy class seats. These seats are divided into three sections. First section contains 10 rows of seats. The seats of the 1st row, i.e. the seats 1AC and 1DF are designated by Spirit Airlines as Big Front Seats. These seats have the following advantages: 6-8 inches of extra legroom, wider seats of 20 inches, bigger seat pitch of 36 inches. An extra fee must be paid to book these seats. Among disadvantages: immovable armrests, lack of floor storage during take-off and landing and close location of the galley and lavatory. All the seats of the economy class are not reclining and have only 28 inch seat pitch. The other rows of the first section are standard. 8 of them have 3-3 configuration and the last row of the section has 2-2 configuration plus one crew seat. The second section of seats is located behind the exit row and contains 14 rows: 2 of them have 2-2 configuration and 12 rows have 3-3 configuration. Passengers of the seats 11BC, 11DE, 12A and 12F will take advantage of extra legroom. As the tray tables are in the armrests these seats are little narrower than standard and have no floor storage during take-off and landing. The last row in the section, the 24th row also contains a crew seat. The last section consists of 14 rows as well. Additional space for passengers’ legs provides additional comfort for passengers of the seats 25BC, 25DE, 26A and 26F. However, the width of these seats is slightly reduced and there is no floor storage for these seats during take-off and landing. Passengers of the seats of the 38th row will be among the last to deplane upon arrival and will also feel some discomfort because of the galley and lavatories located behind. These seats are considered bad seats. This version of Airbus A321 may accommodate 228 passengers of economy class. The seats are divided onto three sections. All seats of the economy class have 28 inch seat pitch and do not recline. First 2 rows of seats offer 8 seats of Big Front type to book which an extra fee must be paid. 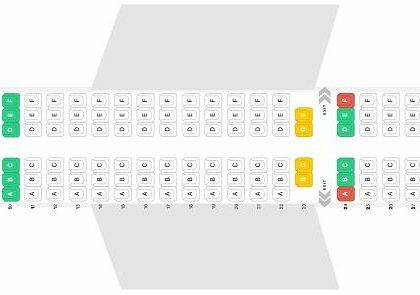 So, passengers of the seats 1AC, 1DF and 2AC, 2DF will feel comfortable thanks to additional space for their legs, bigger seat pitch and width. At the same time because of the tray tables that are built-in the armrests of the seats of the 1st row these armrests are not immovable. Also these seats have no floor storage during take-off and landing and are located close to the galley and lavatory. The other 8 rows of the first section are standard. 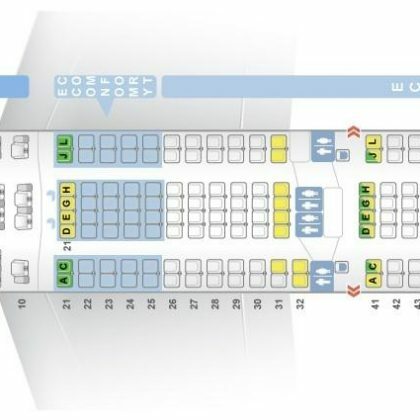 The seats of these rows have 3-3 configuration except the 10th row that contains 5 passenger seats and 1 crew seat. 14 rows are located in the second section. 13 of these rows may accommodate 6 passengers each and 24th row has just 5 seats for passengers and 1 crew seat. Thanks to the exit row located in front the seats of the 11th row offer extra legroom for passengers of these seats. However, these sears are a little narrower than standard and have no floor storage during take-off and landing. Behind exit row the third section contains 15 rows of seats per 6 in each. So, there are totally 90 seats here. Passengers of the seats of the 25th row will take advantage of extra space for their legs. Among disadvantages: lack of floor storage during take-off and landing and reduced seat width due to immovable armrests. The noise from the galley and lavatories located behind will cause discomfort to passengers of the seats of the last 39th row. Passengers of these seats will be among the last to deplane upon arrival. Due to these disadvantages these seats are considered bad seats.